The Binding Router Jig is used to easily cut binding and purfling channels on guitars, especially useful for carved tops and acoustics where the top is not square to the sides. The router is fixed to a carriage which moves up and down on bearings vertically, the plastic guide ring on the bottom of the carriage follows the height of the guitar top (use a router bit with a bottom bearing to set the depth of the channel cut). There are adjustable top and bottom stops to ensure the router carriage does not come off the carriage track on the support post. The guitar body rests on four support blocks which are all height adjustable to ensure you can set up the guitar sides square to the jig, the four support blocks also adjust horizontally to adjust to different body shapes. To use the jig you will need to construct a base board and a guitar body base to fix the body support blocks to (this needs to be flat and stable, so use high quality marine plywood or similar). 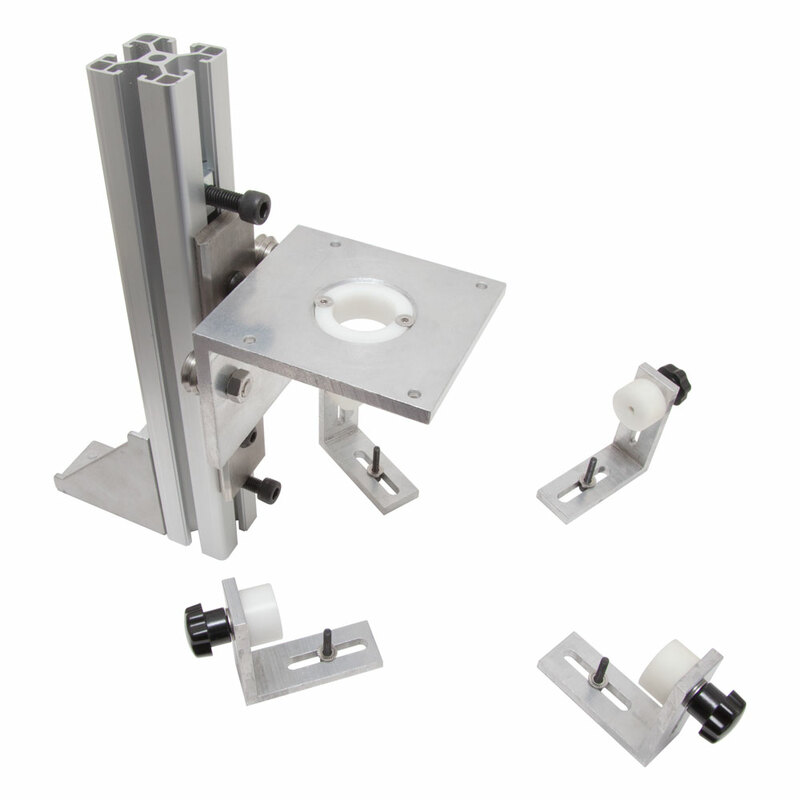 You will need to drill the base board to mount the support post, two threaded T nut inserts and screws are provided for mounting the support post to the base board. You will need to drill the guitar body base to mount the four support blocks, the body is set up upside down, place the base face down on the bottom of the guitar, adjust the body supports horizontally so the plastic section lines up with the guitar edge and tighten the allen head bolt, then flip the base over to use the thumb screws to set the height.